William Henry “Bill” Gates III (born October 28, 1955) an American business magnate, philanthropist, author, and chairman Microsoft, the software company he founded with Paul Allen. He is ranked consistently one of the world’s wealthiest people and the wealthiest overall as of 2009. During his career at Microsoft, Gates held the positions of CEO and chief software architect, and remains the largest individual shareholder with more than 8 percent of the common stock. He has also authored or co-authored several books. Gates is one of the best-known entrepreneurs of the personal computer revolution. Although he is admired by many, a number of industry insiders criticize his business tactics, which they consider anti-competitive, an opinion which has in some cases been upheld by the courts.In the later stages of his career, Gates has pursued a number of philanthropic endeavors, donating large amounts of money to various charitable organizations and scientific research programs through the Bill & Melinda Gates Foundation, established in 2000. Bill Gates stepped down as chief executive officer of Microsoft in January, 2000. He remained as chairman and created the position of chief software architect. In June, 2006, Gates announced that he would be transitioning from full-time work at Microsoft to part-time work and full-time work at the Bill & Melinda Gates Foundation. He gradually transferred his duties to Ray Ozzie, chief software architect and Craig Mundie, chief research and strategy officer. Gates’ last full-time day at Microsoft was June 27, 2008. He remains at Microsoft as non-executive chairman. Gates was born in Seattle, Washington, to William H. Gates, Sr. and Mary Maxwell Gates, who was of Scottish descent. His family was upper middle class; his father was a prominent lawyer, his mother served on the board of directors for First Interstate BancSystem and the United Way, and her father, J. W. Maxwell, was a national bank president. Gates has one elder sister, Kristi (Kristianne), and one younger sister, Libby. He was the fourth of his name in his family, but was known as William Gates III or “Trey” because his father had dropped his own “III” suffix.Early on in his life, Gates’ parents had a law career in mind for him. At the end of the ban, the four students offered to find bugs in CCC’s software in exchange for computer time. Rather than use the system via teletype, Gates went to CCC’s offices and studied source code for various programs that ran on the system, including programs in FORTRAN, LISP, and machine language. The arrangement with CCC continued until 1970, when the company went out of business. The following year, Information Sciences Inc. hired the four Lakeside students to write a payroll program in COBOL, providing them computer time and royalties. After his administrators became aware of his programming abilities, Gates wrote the school’s computer program to schedule students in classes. He modified the code so that he was placed in classes with mostly female students. He later stated that “it was hard to tear myself away from a machine at which I could so unambiguously demonstrate success.” At age 17, Gates formed a venture with Allen, called Traf-O-Data, to make traffic counters based on the Intel 8008 processor. In early 1973, Bill Gates served as a congressional page in the U.S. House of Representatives. Gates graduated from Lakeside School in 1973. He scored 1590 out of 1600 on the SAT and subsequently enrolled at Harvard College in the fall of 1973. Prior to the mid-1990s, an SAT score of 1590 corresponded roughly to an IQ of 170, a figure that has been cited frequently by the press. While at Harvard, he met his future business partner, Steve Ballmer, whom he later appointed as CEO of Microsoft. He also met computer scientist Christos Papadimitriou at Harvard, with whom he collaborated on a paper about pancake sorting. He did not have a definite study plan while a student at Harvard and spent a lot of time using the school’s computers. Gates also took the infamously difficult Math 55 class, which he said taught him that there were people smarter than him. He remained in contact with Paul Allen, joining him at Honeywell during the summer of 1974. The following year saw the release of the MITS Altair 8800 based on the Intel 8080 CPU, and Gates and Allen saw this as the opportunity to start their own computer software company. He had talked this decision over with his parents, who were supportive of him after seeing how much Gates wanted to start a company. 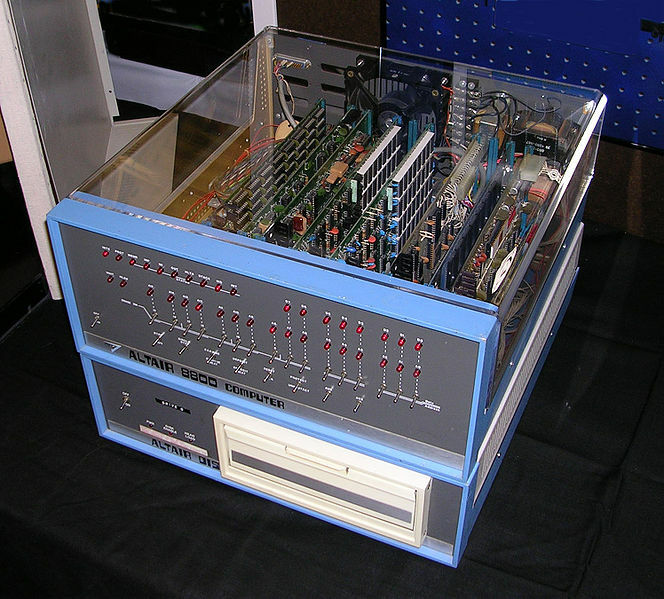 After reading the January 1975 issue of Popular Electronics that demonstrated the Altair 8800, Gates contacted Micro Instrumentation and Telemetry Systems (MITS), the creators of the new microcomputer, to inform them that he and others were working on a BASIC interpreter for the platform. In reality, Gates and Allen did not have an Altair and had not written code for it; they merely wanted to gauge MITS’s interest. MITS president Ed Roberts agreed to meet them for a demo, and over the course of a few weeks they developed an Altair emulator that ran on a minicomputer, and then the BASIC interpreter. The demonstration, held at MITS’s offices in Albuquerque, was a success and resulted in a deal with MITS to distribute the interpreter as Altair BASIC. Paul Allen was hired into MITS, and Gates took a leave of absence from Harvard to work with Allen at MITS in Albuquerque in November 1975. They named their partnership “Micro-Soft” and had their first office located in Albuquerque. Within a year, the hyphen was dropped, and on November 26, 1976, the trade name “Microsoft” was registered with the Office of the Secretary of the State of New Mexico. Microsoft’s BASIC was popular with computer hobbyists, but Gates discovered that a pre-market copy had leaked into the community and was being widely copied and distributed. In February 1976, Gates wrote an Open Letter to Hobbyists in the MITS newsletter saying that MITS could not continue to produce, distribute, and maintain high-quality software without payment. This letter was unpopular with many computer hobbyists, but Gates persisted in his belief that software developers should be able to demand payment. Microsoft became independent of MITS in late 1976, and it continued to develop programming language software for various systems. The company moved from Albuquerque to its new home in Bellevue, Washington on January 1, 1979. During Microsoft’s early years, all employees had broad responsibility for the company’s business. Gates oversaw the business details, but continued to write code as well. In the first five years, he personally reviewed every line of code the company shipped, and often rewrote parts of it as he saw fit. In 1980, IBM approached Microsoft to write the BASIC interpreter for its upcoming personal computer, the IBM PC. When IBM’s representatives mentioned that they needed an operating system, Gates referred them to Digital Research (DRI), makers of the widely used CP/M operating system. IBM’s discussions with Digital Research went poorly, and they did not reach a licensing agreement. IBM representative Jack Sams mentioned the licensing difficulties during a subsequent meeting with Gates and told him to get an acceptable operating system. A few weeks later Gates proposed using 86-DOS (QDOS), an operating system similar to CP/M that Tim Paterson of Seattle Computer Products (SCP) had made for hardware similar to the PC. Microsoft made a deal with SCP to become the exclusive licensing agent, and later the full owner, of 86-DOS. After adapting the operating system for the PC, Microsoft delivered it to IBM as PC-DOS in exchange for a one-time fee of $50,000. Gates did not offer to transfer the copyright on the operating system, because he believed that other hardware vendors would clone IBM’s system. They did, and the sales of MS-DOS made Microsoft a major player in the industry. Gates oversaw Microsoft’s company restructuring on June 25, 1981, which re-incorporated the company in Washington and made Gates President of Microsoft and the Chairman of the Board. Microsoft launched its first retail version of Microsoft Windows on November 20, 1985, and in August, the company struck a deal with IBM to develop a separate operating system called OS/2. Although the two companies successfully developed the first version of the new system, mounting creative differences undermined the partnership. Gates distributed an internal memo on May 16, 1991 announcing that the OS/2 partnership was over and Microsoft would shift its efforts to the Windows NT kernel development. From Microsoft’s founding in 1975 until 2006, Gates had primary responsibility for the company’s product strategy. He aggressively broadened the company’s range of products, and wherever Microsoft achieved a dominant position he vigorously defended it. Gates’s role at Microsoft for most of its history was primarily a management and executive role. However, he was an active software developer in the early years, particularly on the company’s programming language products. He has not officially been on a development team since working on the TRS-80 Model 100 line, but wrote code as late as 1989 that shipped in the company’s products. On June 15, 2006, Gates announced that he would transition out of his day-to-day role over the next two years to dedicate more time to philanthropy. He divided his responsibilities between two successors, placing Ray Ozzie in charge of day-to-day management and Craig Mundie in charge of long-term product strategy. Early rounds of his deposition show him offering obfuscatory answers and saying ‘I don’t recall,’ so many times that even the presiding judge had to chuckle. Worse, many of the technology chief’s denials and pleas of ignorance were directly refuted by prosecutors with snippets of e-mail Gates both sent and received. Gates later said that he had simply resisted attempts by Boies to mis-characterize his words and actions. As to his demeanor during the deposition, he said, “Did I fence with Boies? … I plead guilty. Whatever that penalty is should be levied against me: rudeness to Boies in the first degree.” Despite Gates’s denials, the judge ruled that Microsoft had committed monopolization and tying, blocking competition, in violation of the Sherman Antitrust Act. Bill Gates decided in 2008 to appear in at least one commercial in a series of ads to promote Microsoft. This commercial, co-starring Jerry Seinfeld, is a 90-second talk between strangers as Seinfeld walks up on a discount shoe store (Shoe Circus) in a mall and notices Bill Gates buying shoes inside. The salesman is trying to sell Mr. Gates shoes that are a size too big. Mr. Seinfeld begins to inform him about a pair of shoes called Conquistadors that run “a little tight” and sells him on them in a size 10 (whereas the store clerk was attempting an 11). 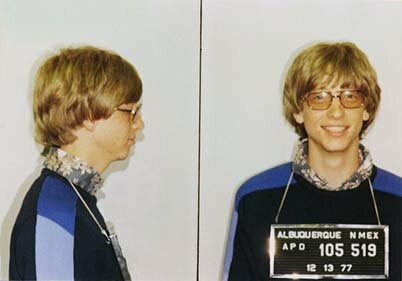 As Mr. Gates is buying the shoes he holds up his discount card, this card uses a slightly altered version of his own mugshot of his arrest in New Mexico in 1977 for a traffic violation. As they are walking out of the mall, Jerry Seinfeld asks Bill Gates if he has melded his mind to other developers, after getting a yes, he then asks if they are working on a way to make computers edible, again getting a yes. Some say that this is an homage to Mr. Seinfeld’s own show about “nothing” (Seinfeld). In a second commercial in the series, Bill Gates and Jerry Seinfeld are at the home of an average family trying to fit in with normal people. All is going well until they are accused by the family of stealing their leather giraffe from Cabo San Lucas, which was found in Bill Gate’s backpack. In the end, they find out that the teenage girl in the family set them up so she could have her room back, and in the end they leave the house and Jerry Seinfeld tells Bill Gates to do the robot if an Amoeba will someday have a blog and if goldfish will someday have an e-mail address. After Bill Gates does the robot, they look for other houses to go to. The stupidest thing i have ever seen!! Gates married Melinda French from Dallas, Texas on January 1, 1994. They have three children: Jennifer Katharine (1996), Rory John (1999) and Phoebe Adele (2002). The Gateses’ home is an earth-sheltered house in the side of a hill overlooking Lake Washington in Medina, Washington. According to King County public records, as of 2006 the total assessed value of the property (land and house) is $125 million, and the annual property tax is $991,000. His 66,000 sq. ft. estate has a 60-foot swimming pool with an underwater music system, as well as a 2500 sq. ft. gym and a 1000 sq. ft. dining room. Also among Gates’s private acquisitions is the Codex Leicester, a collection of writings by Leonardo da Vinci, which Gates bought for $30.8 million at an auction in 1994. Gates is also known as an avid reader, and the ceiling of his large home library is engraved with a quotation from The Great Gatsby.He also enjoys playing bridge, tennis, and golf. Gates was number one on the “Forbes 400” list from 1993 through to 2007 and number one on Forbes list of “The World’s Richest People” from 1995 to 2007 and 2009. In 1999, Gates’s wealth briefly surpassed $101 billion, causing the media to call him a “centibillionaire”. Since 2000, the nominal value of his Microsoft holdings has declined due to a fall in Microsoft’s stock price after the dot-com bubble burst and the multi-billion dollar donations he has made to his charitable foundations. 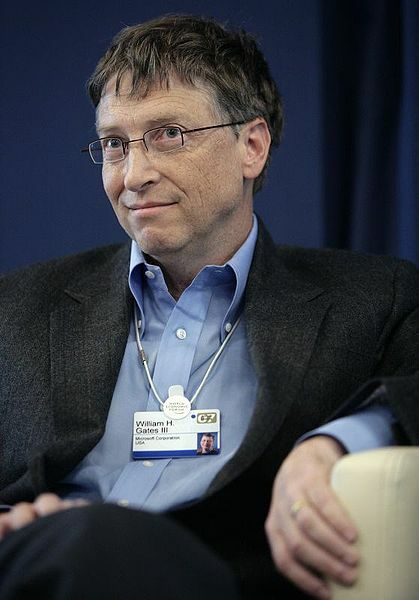 In a May 2006 interview, Gates commented that he wished that he were not the richest man in the world because he disliked the attention it brought. Gates has several investments outside Microsoft, which in 2006 paid him a salary of $616,667, and $350,000 bonus totalling $966,667. He founded Corbis, a digital imaging company, in 1989. In 2004 he became a director of Berkshire Hathaway, the investment company headed by long-time friend Warren Buffett. Gates began to realize the expectations others had of him when public opinion mounted that he could give more of his wealth to charity. Gates studied the work of Andrew Carnegie and John D. Rockefeller and in 1994 sold some of his Microsoft stock to create the William H. Gates Foundation. In 2000, Gates and his wife combined three family foundations into one to create the charitable Bill & Melinda Gates Foundation, which is the largest transparently operated charitable foundation in the world. foundation is set up to allow benefactors access to how its money is being spent, unlike other major charitable organizations such as the Wellcome Trust.The generosity and extensive philanthropy of David Rockefeller has been credited as a major influence. Gates and his father have met with Rockefeller several times and have modeled their giving in part on the Rockefeller family’s philanthropic focus, namely those global problems that are ignored by governments and other organizations. 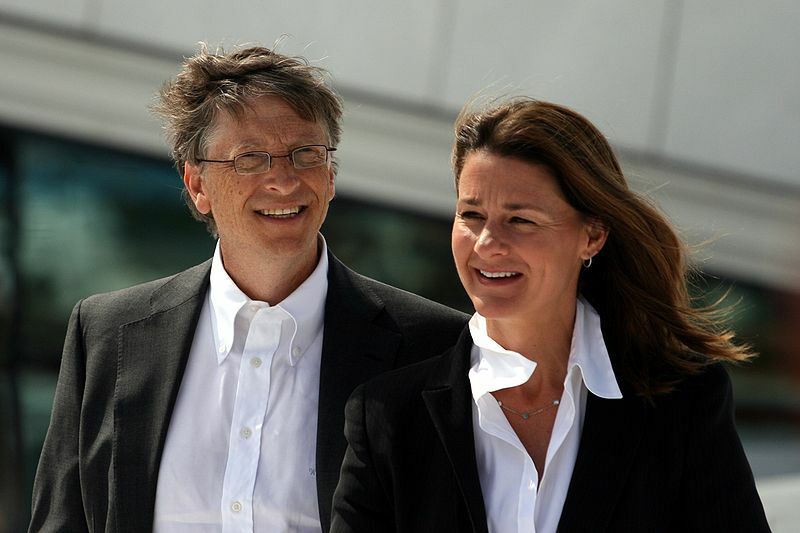 As of 2007 Bill and Melinda Gates were the second most generous philanthropists in America, having given over $28 billion to charity. The foundation has also received criticism because it invests the assets that it has not yet distributed, with the exclusive goal of maximizing the return on investment. As a result, its investments include companies that have been criticized for worsening poverty in the same developing countries where the Foundation is attempting to relieve poverty. These include companies that pollute heavily and pharmaceutical companies that do not sell into the developing world. In response to press criticism, the foundation announced in 2007 a review of its investments to assess social responsibility. It subsequently canceled the review and stood by its policy of investing for maximum return, while using voting rights to influence company practices. Time magazine named Gates one of the 100 people who most influenced the 20th century, as well as one of the 100 most influential people of 2004, 2005, and 2006. 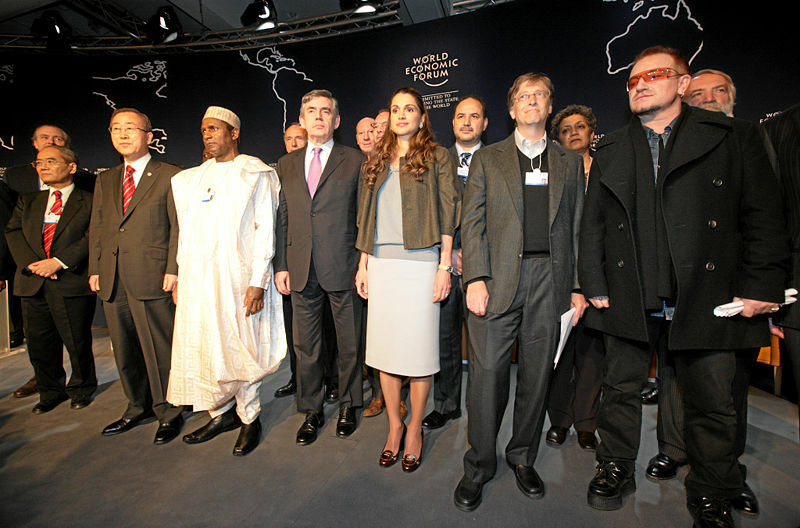 Time also collectively named Gates, his wife Melinda and rock band U2’s lead singer Bono as the 2005 Persons of the Year for their humanitarian efforts. In 2006, he was voted eighth in the list of “Heroes of our time”. Gates was listed in the Sunday Times power list in 1999, named CEO of the year by Chief Executive Officers magazine in 1994, ranked number one in the “Top 50 Cyber Elite” by Time in 1998, ranked number two in the Upside Elite 100 in 1999 and was included in The Guardian as one of the “Top 100 influential people in media” in 2001. Gates has received honorary doctorates from Nyenrode Business Universiteit, Breukelen, The Netherlands in 2000, the Royal Institute of Technology, Stockholm, Sweden in 2002, Waseda University, Tokyo, Japan in 2005, Harvard University in June 2007, and from Karolinska Institutet, Stockholm, in January 2008. Gates was also made an honorary Knight Commander of the Order of the British Empire (KBE) by Queen Elizabeth II in 2005 addition to having entomologists name the Bill Gates flower fly, Eristalis gatesi, in his honor. In November 2006, he and his wife were awarded the Order of the Aztec Eagle for their philanthropic work around the world in the areas of health and education, particularly in Mexico, and specifically in the program “Un país de lectores”. This was all about Bill Gates. Please do comment if you liked the post.